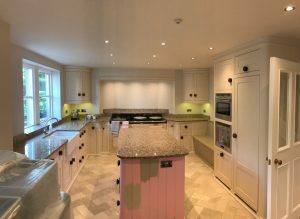 Looking on the internet for a quality kitchen painter with a good track record and ability to paint kitchens to the highest standards is difficult. Mark Wilkinson pride them self as front runners in the hand painted kitchen market. HPKUK pride them self as the front runners in re painting kitchens. Photographs were sent of their kitchen so it could priced it up. 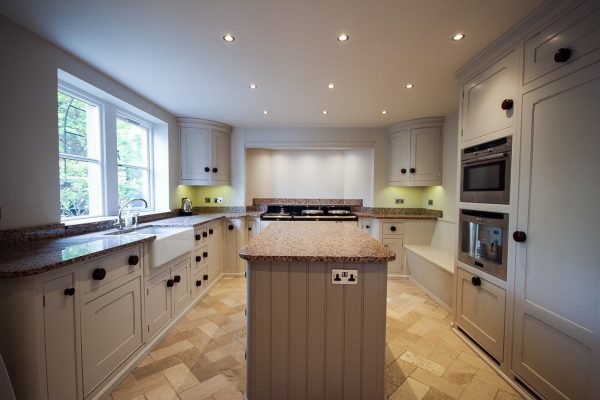 Knowing how much work is involved in dismantling and resembling these types of kitchens is a must. I was invited round to discuss the job and show them a painted sample. It was noted that the original hinges were covered in paint and the finish wasn’t the best. I suggested all the doors and drawers needed to be eased as some were binding. With the price agreed and a date booked we looked through the colours. The colours would be confirmed nearer to the date of us starting. With all the kitchens we do good preparation is key to a great job. The kitchen is completely dismantled, then taken back to the workshop noting which door and drawer get put back in their rightful place. 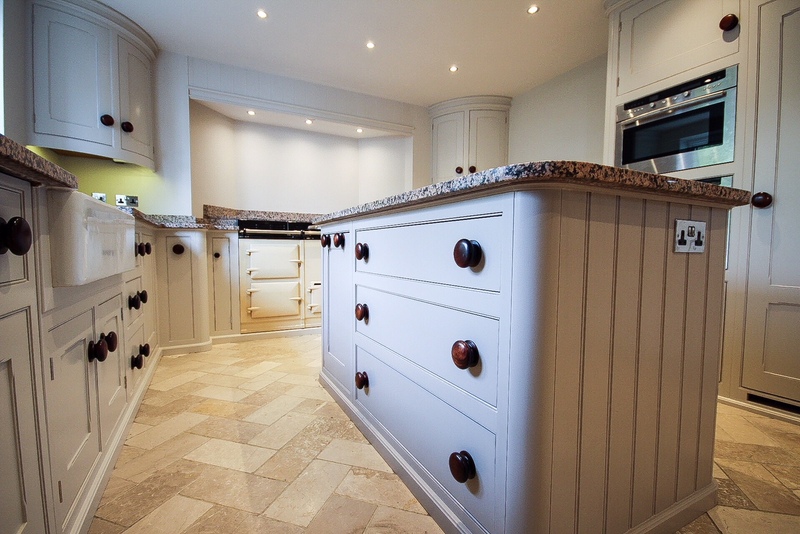 We fully protect the worktops and the floor to ensure all surfaces are covered. The paintwork is cleaned using a trade strength de-greaser, removing grime that would otherwise ruin our paint finish. Rinsing is a vital part of the process as this removes the residue. The paintwork is all sanded using the latest dustless sanders. The next stage is to remove the finer bits of dust via a tack cloth. Now its ready to be painted using an oil grip primer which dries to a marble like finish. The dry surface is a perfect base coat for the two top coats of waterborne furniture paint as used by Mark Wilkinson themselves. With the frame done as the same time as the doors its all put back together. The knobs also got a revamp having been covered in paint before. These were treated to a sand and clean followed by a re stain and re lacquer. The Mark Wilkinson dining table was re vamped too. The center leg was painted to match the kitchen units. The table top stripped back, then re lacquered. 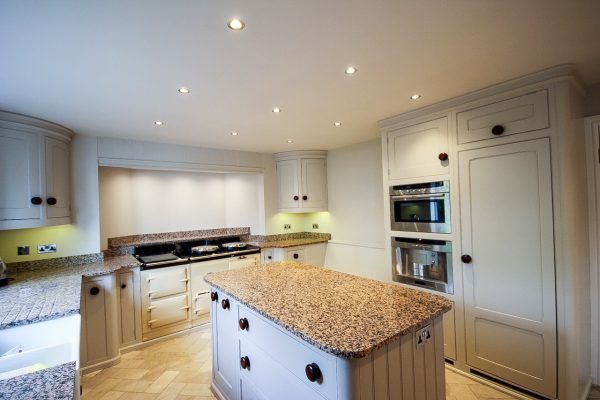 Now the kitchen has the wow factor and looks better than before. If your interested in having your kitchen re painted you can get in touch via our website.